The topology of the puzzling shape I discussed in yesterday’s post is really fascinating. 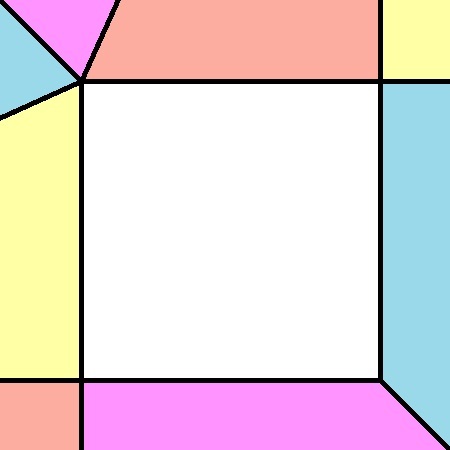 In some ways it acts like a square, but a very strange square. Imagine that you lived in a house on a square plot of land. On all four sides you have neighbors, and when you step from your property onto an adjoining property, that neighboring yard seems like a perfectly normal square. So wherever you go, everything appears fine and undistorted. But the rules for travel are a little interesting, because things act kind of funny at some of the corners. Your neighborhood to the southwest and northeast seems normal — each neighbor shares one other mutual neighbor between them. As we already know from the posts of the last two days, the world you are living on consists of sixty plots of land, and the topology of that world is a sphere. This entry was posted on Sunday, October 30th, 2011 at 8:01 pm	and is filed under Uncategorized. You can follow any responses to this entry through the RSS 2.0 feed. You can leave a response, or trackback from your own site.